This week's contest should bring on a case of deja vu... 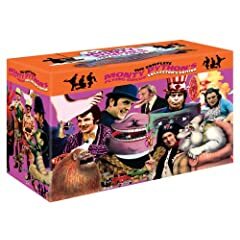 This morning, while packing up and mailing off the The Complete Monty Python's Flying Circus: Collector's Edition Megaset to the winner of last week's contest, I discovered another unopened copy of the box set in my DVD library. Since I already have the complete original series on DVD, I decided to give this copy away, too. This week's prize is another copy of The Complete Monty Python's Flying Circus: Collector's Edition Megaset. This 21-disc collection features the entire television series, the Personal Best specials of the six principal actors, two live performances, as well as two documentaries about the comedy troupe, Before the Flying Circus and Monty Python Conquers America. Last week's Monty Python Megaset drew a lot of interest (drawing over 500 entries), here is another chance to win this amazing box set. To enter, leave a comment naming your favorite television comedy character of all time. For the record, mine is the wonderfully neurotic George Costanza. The winner will be chosen at random late Wednesday evening (March 4th).